Founded in 1981, the UHCL Alumni Association represents more than 60,000 alumni. 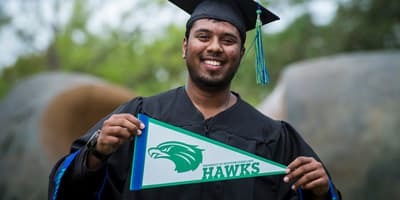 It was created to enhance the pride, loyalty and engagement of its alumni by connecting them to fellow UHCL alumni, students, parents and friends of the university through support services, activities and events. 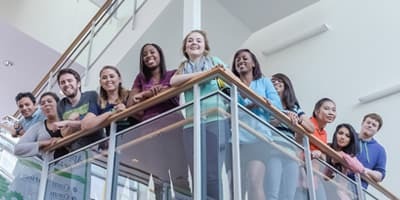 Working in connection with University Advancement, the association promotes the educational programs and objectives of the university by providing alumni opportunities to remain involved with their alma mater. The UHCL Alumni Association supports three endowments – the UHCL Alumni Association Scholarship Endowment for current students, the UHCL Distinguished Alumni Scholarship Endowment for descendants of UHCL alumni and the UHCL Alumni Association Program Endowment to support student programming, faculty research and development. All UHCL graduates and recipients of teacher’s certificates are automatically members of the UHCL Alumni Association; no dues are necessary. Lifetime Alumni Membership is available with a one-time contribution of at least $500 which entitles members to exclusive benefits beyond the general alumni association membership. Pictured are newly elected members of the alumni association board of directors during a reception for noted atomic physicist Dr. Edward Teller. On the far left is Mike Reeves, the founding president of the association. Mike remains involved and supportive today. 1981 The UHCL Alumni Association is formed by a small group of alumni, and inaugurates its first association president, Micheal Reeves. 1984 Inaugurates the annual Bayou Ball, a precursor to Alumni Celebration, honoring the first two Distinguished Alumni (Marilyn K. Wiley and Elizabeth Finck Leibfried) and begins funding scholarships. 1986 Establishes the Alumni Scholarship Fund, which is later endowed. 1989 Co-founds a university-wide fund, "Funding Our Future," which set the stage for the current university annual fund program. 1995 Gives a $55,000 contribution to the UHCL Alumni Association Scholarship Endowment, the university's largest endowment. 1997 Reaches the $100,000 mark in contributions to the UHCL Alumni Association Scholarship Endowment. 1999 As a tribute to UHCL's 25th Anniversary, creates distinguished alumni "Wall of Honor," a photo display in Atrium I of the Bayou Building, to recognize alumni who have made significant contributions to society and whose accomplishments and careers have brought credit to the institution. Establishes the UHCL Alumni Association Program Development Endowment to support faculty, student and staff programmatic development initiatives other than scholarships. Surpasses its goal to raise $500,000 for the UHCL Alumni Association Scholarship Endowment. 2003 Establishes Distinguished Alumni Legacy Scholarship Fund, created specifically for descendants of UHCL alumni. 2004 Creates the Leadership Service Award, honoring Marilyn Lunney as its first recipient. Opens association membership to all alumni and eliminates dues. Establishes the Early Achievement Award, honoring Cris Daskevich as its first recipient. Dedicates Alumni Plaza, located between the Bayou Building and the Student Services and Classroom Building. This area includes Distinguished Alumni Fountain and the Distinguished Alumni Wall, a granite wall listing all recipients of UHCL’s Distinguished Alumni Award. Creates Commencement Kick-Off, a celebratory event held prior to graduation to welcome new alumni into the UHCL Alumni Association. Establishes the Outstanding Professor Award, honoring Charles McKay as its first recipient. Number of university alumni exceeds 50,000 and the association celebrates the milestone with “50 Grand” events and activities throughout the year. Establishes the Alumni Association Executive Council, in its current format. 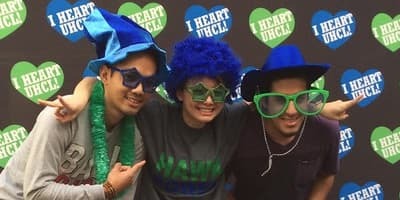 Launches the UHCL Alumni Association fan page on Facebook. Establishes AlumNights, casual networking receptions held throughout the community designed to give alumni the opportunity to catch up with old friends and make new connections. Creates Small Talk. Big Ideas. Breakfast with an Expert., a morning of fascinating discussions over breakfast with various university experts on a range of thought-provoking topics. Begins Alumni Coffee Tables, a monthly service initiative where alumni volunteer to interact with students by serving free coffee and treats. Collaborates with the Office of Student Life to produce Welcome Back Bash, a family-oriented event held the first week of the fall semester featuring food, music, games and activities presented by both alumni and student organizations.